A very unique dish and pretty easy to make, these rice pancakes will have your Thai cravings thoroughly satisfied in no time. Actually, the only Thai ingredient and flavor that comes through in this recipe is the coconut milk...while green onions, roasted peanuts, and fresh ginger give this an all-around Asian flair. Cooked white rice (I used jasmine) is added to the aforementioned ingredients, along with a little flour and eggs for binding. Cilantro is even included, giving this a fresh herbal flavor. These are cooked as you would any regular pancake, although you do need to shape them slightly once in the skillet. I would highly suggest salt-and-peppering the batter before cooking (whoops, I missed this step): the pancakes are far from bland, with all those exotic flavors, but a little seasoning would have brought everything out even more. But, served with a little side condiment (chutney, dressing, sauce, etc. 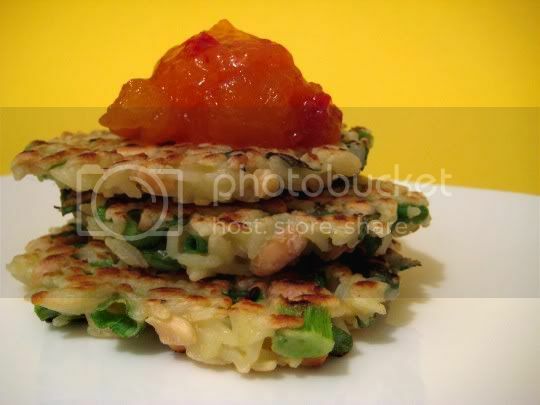 ), these pancakes are a wonderful light dinner or even appetizer. Make again? Yes, although I'd kick up the seasoning a notch!